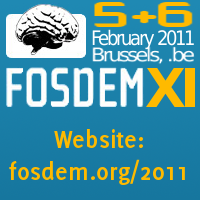 We’re going to FOSDEM again. This year we’ll ship over the entire company (all three of us) and we’ll join up with a few fellow Rockbox hackers and spend a weekend in Brussels among thousands of fellow free software and open source hackers. During this conference, 5-6 February, I’ve submitted a libcurl-related talk to the embedded-room that wasn’t accepted into the regular program, but I’ve agreed to still prepare it and I then might get a slot in case someone gets sick or something. A bit ungrateful as now I still have to prepare my slides for the talk but there’s a big risk that I’ve done it in vain! I’ve also submitted a suggestion for a second talk in the opensc/security room (also related to stuff in the curl project) but as of now (with but 16 days left) that schedule is yet to be announced so I don’t know if I’ll do a talk there or not. So, I might do no talks. I might do two. I just don’t know. We’ll see. If you’re a friend of mine and you’re going to FOSDEM this year, please let me know and we can meet and have a chat or whatever. I love getting faces to all the names, nicks and email addresses I otherwise only see of many people. Update: My talk in the security room is titled “libcurl: Supporting seven SSL libraries and one SSH library” and will start at 14:15 on Saturday the 5th of February. 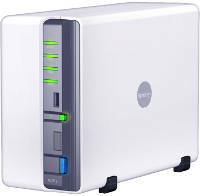 I finally got my act together and bought myself a Synology DS211j NASÂ with two 2TB drives. I’ll use it as a shared network disk at home and I intend to backup to it – as I also have a home office it’ll feel better to be able to also backup company related data somewhat more safely. My previous backup was only copying data from one HDD to another within the same physical machine. To make it slightly more resistant to disk and hardware errors I’ve configured the disks to do RAID1 (all data is stored on both disks simultaneously). The GPLv2 license was provided printed on paper in the package.